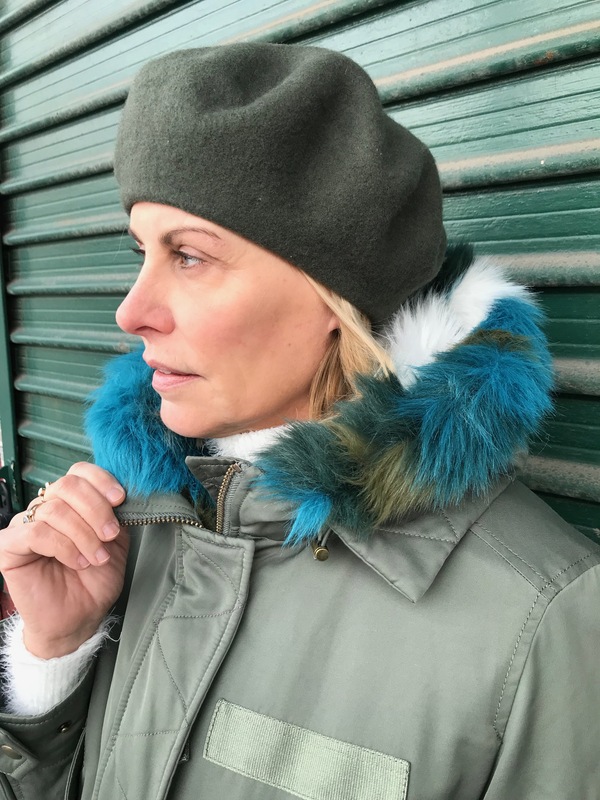 We shot this post a few weeks back, and I was so excited to feature this fantastic faux fur-trimmed parka (now on sale!). 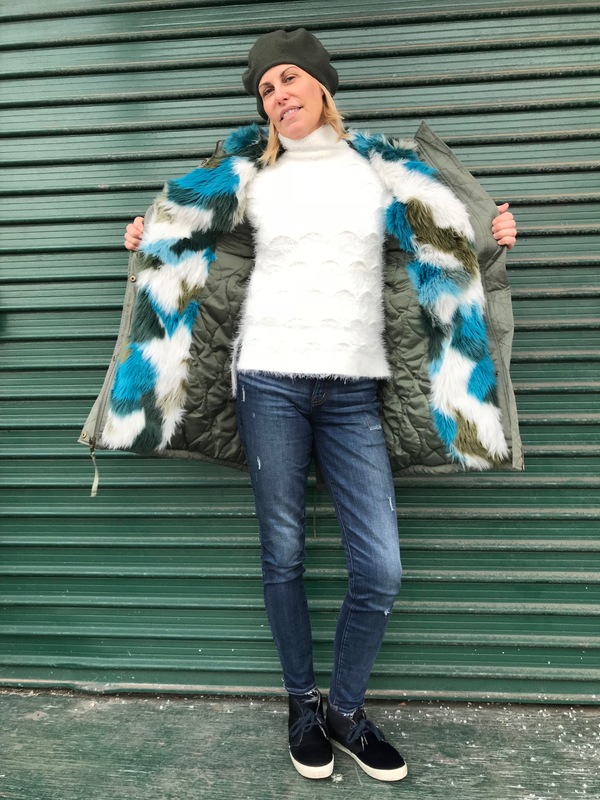 But then Bomb Cyclone blew in, along with arctic temps, and fun fashion flew off the radar. Fortunately “normal” winter weather has returned, and I can put this parka, along with a snappy beret and footwear other than snow boots, into heavy rotation. Can I just say that until a day or two ago, the thought of walking around with my coat open and no gloves would have been sheer madness. Luckily the cold snap has broken and outerwear can be about more than survival dressing. So this parka? It’s everything. Practical and pretty. Cozy and chic. Roomy not baggy. It’s detailed with lots of pockets, a hidden zip/snap front, and an interior drawstring to shape its waistline. And I just LOVE the colorful faux fur that lines the body and trims the hood. For me, this is a piece where investment meets fun. It will make me happy to bundle up this winter and beyond, and that’s worth a lot. Since Chris and I were really just doing a weekend stroll, I kept everything casual. But this turtleneck eyelash sweater would look great paired with velvet jeans or a midi skirt and the white booties I wore here. I love its cloud-like color, the detail of the knit, and the fact that a turtleneck forgives those neck crinkles while eliminating the need for a scarf. My jeans are from Madewell, my new favorite brand in the denim arena. They’ve been featured here, here and here…as well as quite a few other posts. Right now I think Madewell is simply the best at bringing fit, style, quality and price all together. How cute is this beret? It takes me back to elementary school when we had to wear berets to chapel, but I loved wearing mine all the time. So glad they’re back on the fashion scene. It’s fun to play with how you wear it, too. 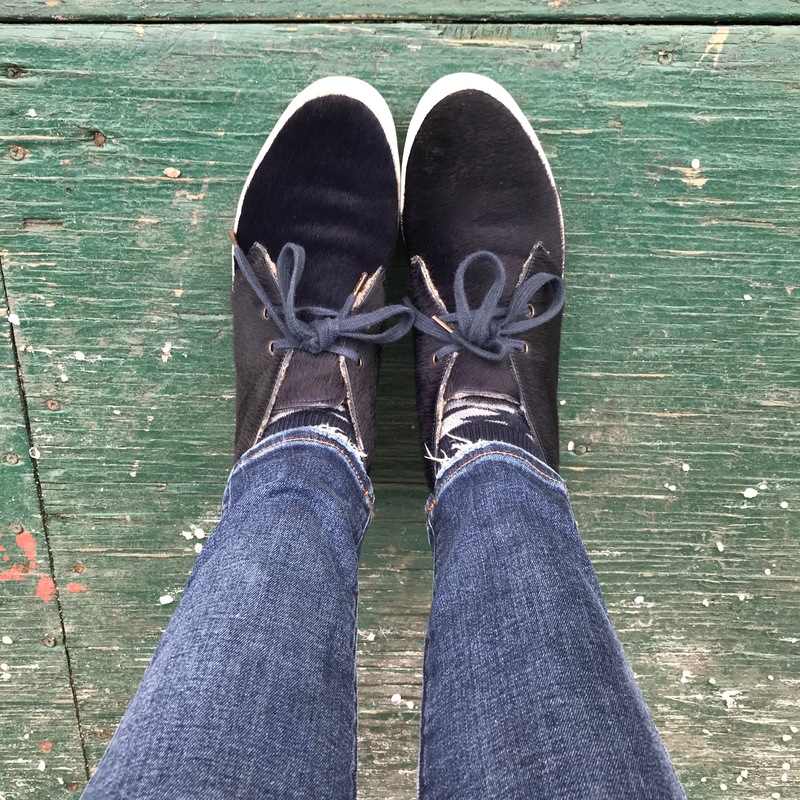 These shearling sneakers were a splurge a few years back, but after all the wear and comfort I’ve gotten out of them they look more like smart shopping. A great alternative to booties, too. It’s 44 degrees today so I’m taking this parka and beret out for a trek into NYC. Heck, probably this whole look. Hope it inspires you to change up something in your winter wardrobe, even if in some small way. And there are super sales…everywhere. Remember we’ve got February and March ahead of us! 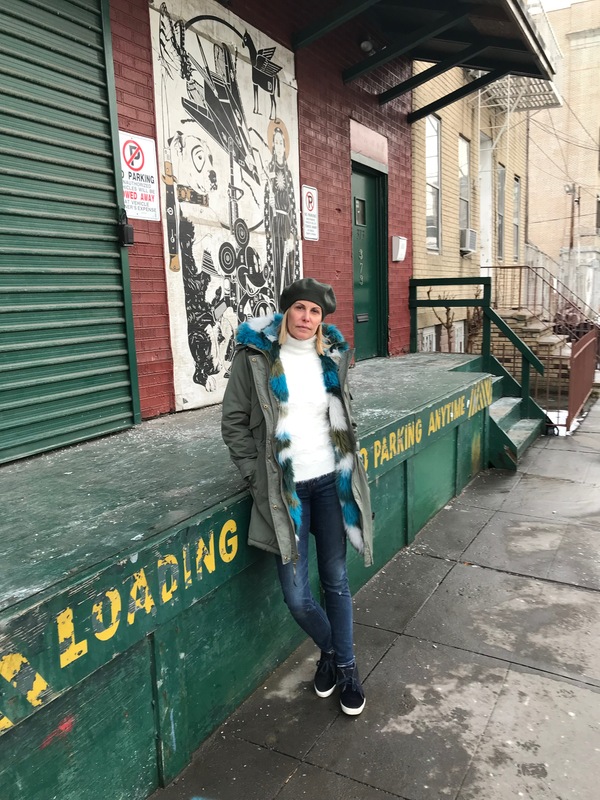 Parka: (Gap, on sale, lots of sizes!) this is also super cute and on sale, too. Sweater: (Nordstrom Rack, a deal!) Also like this cashmere wool blend one, also on sale. Jeans: (Madewell, sold out) But check out all their denim here. Beret: (Topshop x Nordstrom, sold out) Similar (if not exact! ) here, in a lot of colors as well. Sneakers: (Penelope Chilvers, old) If you’re an intrepid shopper, this is their online store, and they do ship all over the world. Love this look on you! The multicolor fur is a real smile-inducer! And thanks for introducing me to Penelope Chivers. Beautiful goods. Thanks, Kathy! PC’s boots and shoes are really special. Try to treat myself every few years — when they are on sale!